Sony's successful, if counter-intuitive next-gen message for the PlayStation 4 at last week's E3 is that things won't change. No disc DRM changes. No new online checks for PS4. You might think Sony doesn't want gaming to change in the PS4 era. Oh, but they do. In fact, if you listen closely, they're veering closer to what Microsoft is envisioning for Xbox One than you may have thought, had you only been focused on the Sony and Microsoft's dueling press conferences. Only Microsoft is planning to make your games not work if you have lost Internet for 24 hours. And, to be fair, only Microsoft is talking about a 10-member "family" game-sharing plan. Both Microsoft and Sony, however, seem to be ready for console gamers to shift their gaming to digital, to bring console game closer to PC and phone gaming, where the default way to get a game is to download it. In fact, it was Sony people who seemed most eager, in interviews with me, to enable a more download-heavy gaming future. "The things we want to see change," Sony's head of worldwide studios, Shuhei Yoshida told me at E3, when I asked him about Sony's hopes for changes in the next gen, "[is to have] more people embrace the digital side and have more people connect." He wants more people to download Sony's ever-growing line-up of interesting and often independently-made downloadable games. Frankly, the PlayStation store is where Sony is presenting some of the system's more innovative stuff. Yoshida: "The things we want to see change [is to have] more people embrace the digital side and have more people connect." It's not just the artsy games—the Journeys and Unfinished Swans—that Sony is selling online. PlayStation v.p. of hardware marketing, John Koller, told me that the company is also committed to continuing to release its big games for download on the same day they come out in stores on disc. Both the PS4 and the Xbox One have the 500GB harddrives to support a gaming future that involves a console user's radically increased consumption of downloaded games. And one can imagine that the DRM for downloaded games isn't going to be all that flexible on either system, not as flexible as it was in the age of trading or trading in game discs. In fact, Microsoft is at least the one articulating a family-sharing plan for digital games. Neither has been clear if there is a real used-game digital plan (and, yes, that concept may simply not make sense) nor have either outlined any ability to lend a friend a downloaded game. Koller: "The difference between an eight hour download and a 15-minute drive to retail—retail is winning that every time...Solving that with PlayGo... is a big win for the digital side of the business." Some gamers will always prefer to get their games on disc. They like to hold a game in their hands. They like to feel as if they possess it and aren't just getting a license to some bits. As long as games are multiple Gigabytes and online connection speeds aren't fast enough to pipe those files through quickly, then discs will stick around. Safe assumption. Well, sorta safe. Sony's Koller said something to me last week that stuck out. He talked about buying discs at a store as if that was a problem, something that the industry needs to solve. "We're very bullish on digital," Koller told me last week. "One of the things we noticed through the progression of building the PlayStation 4 and now that we've announced it, is that immediacy is a big problem in this industry. Digital is really harmed by that. The difference between an eight hour download and a 15-minute drive to retail—retail is winning that every time. Physical gaming will proliferate as long as that continues. Solving that with PlayGo, which gives you a chunk of the [currently downloading] game you can start playing while the rest is buffered in the background, is a big win for the digital side of the business. I think digital will grow a lot more rapidly as a result of that particular point." Koller: "We need to make things easier for people on an immediacy basis, as an industry. We need to make games more accessible." As a games reporter, I can often just get a disc mailed to me for free; even still, lately, I've opted for paying for a download. It's that much less of a hassle. But I have a choice. I could get the game on disc. More importantly, Sony isn't really going out of its way on PS3 to make downloading a game the better option than getting it on disc. 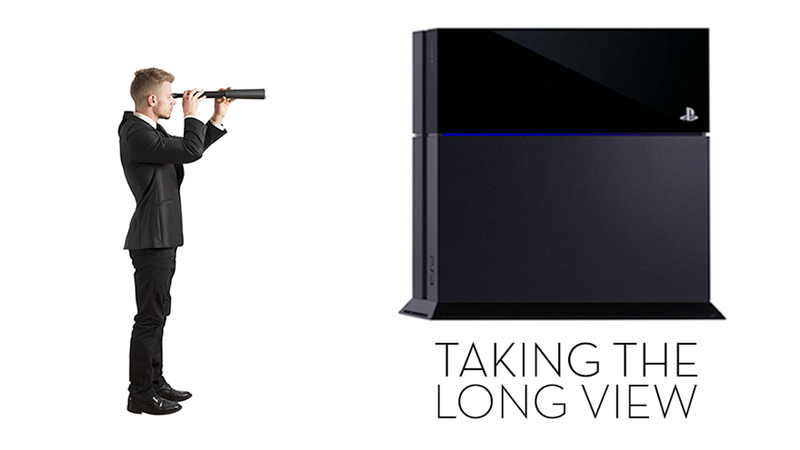 It sounds, from Koller, like they plan to make digital more attractive on PS4. Except, as is the nature of next-gen talk these days, the question then turns to what the DRM on downloads will be. Sony's not talking about digital DRM right now. It's easy to think that Sony would like to shift gaming toward a download model just to cut out game shops and make more profits selling games directly to gamers. It doesn't sound to me, however, that it's close to being that simple. Koller articulated another reason that it's so important for Sony to offer the combination of downloadable games and a PlayGo service that lets you start playing partially-downloaded games almost as soon as the download starts. "There's 220 million Americans who game," he said. "Many of them game on tablets and mobile. When you play a game on tablet or mobile, you may not be playing the deep, rich immersive games you play on console, but you are immediately accessing that content. There's not a lot of lag. So we looked at that. And, as we talked to gamers who were starting to say, 'You know I love console gaming but tablets and mobile are engaging my time,' we realized that as an industry we need to solve that. PlayGo was born of that. We said, 'We need to make it easier for people to get into digital content, so that people don't have to wait around.'" He bottom lined it, talking about PlayGo and Sony's 2014-scheduled Gaikai service that will stream PS3 games to PS4: "We need to make things easier for people on an immediacy basis, as an industry. We need to make games more accessible." Sony wants gaming to be more sudden: You hear about a game and—finger-snap—you're playing it. There's no drive to the store. There's no shrinkwrap to cut. There's no waiting for a progress bar to finish. There's no delay. It happens right away. And, in that scenario, there's no disc in sight.